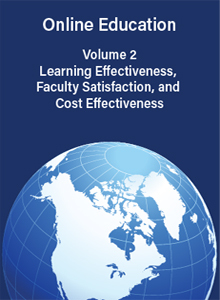 Volume 2 of Online Education focuses on Learning Effectiveness, Faculty Satisfaction and Cost Effectiveness from the perspectives of pioneer colleges and universities with fully online degree programs. 12 case studies examine critical issues involved in online education-how well people learn, how satisfied faculty are, and how institutions of higher learning manage costs. In August 2000, the Alfred P. Sloan Foundation invited 40 guests from 20 institutions of higher learning to a collaborative workshop. The workshop 2000 writers have responded to the issues in this second volume with a forthright willingness to share that is both extraordinary among academicians and representative of the transformative, collaborative effects of online learning practices. Book cover may differ from image.